We have all lost someone dear to us. . . . Yet, it's often as if we live in a world where death never happens, or at least never gets talked about, or mourned or lamented in a collective manner. Born from a shared experience of bereavement, this event offers a celebration, tribute and exploration of dying and grieving and what it means to live every day of your life. Hosted by the Kilgraston School for Girls, Bridge of Earn, Perthshire Scotland. Friday February 11th, 6-9pm: 'Leave to Remain', a powerful and poignant performance and discussion by writer Jo Clifford, actor Suzanne Dance and cellist Harriet Davidson. 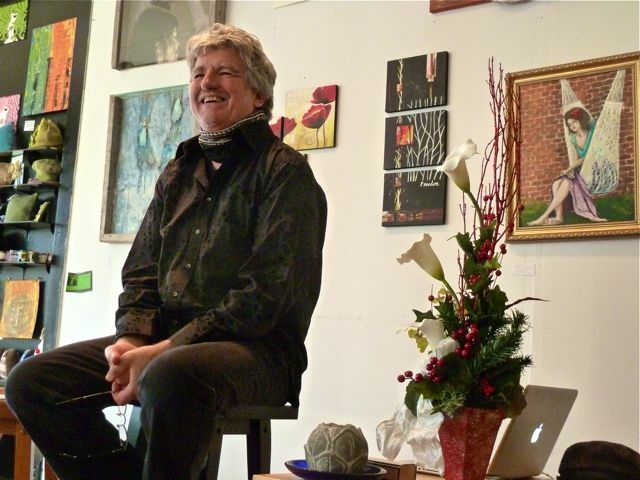 Saturday February 12th, 10-5pm: 'Living Every Day of Your Life', a creative time for reflection and discussion with psychotherapist Martin Williams, storyteller Michael Williams, and lecturer Ruth Cave. Saturday February 12th, 7:30-11:30: a celebratory meal, concert with Mary Mac and friends and ceilidh featuring the Kev Murray Ceilidh Band. Join us at Kilgraston School on Friday February 11th and Saturday 12th for this unique event. To register, contact Ruth Cave at r.d.cave@dundee.ac.uk or on 01382 370768 by 31 January 2011. Eastern Encounters: stories of blessing, hope and transformation. Enjoyed being able to perform these four stories again after their premier at Edinburgh's International Festival of Storytelling in October. The four stories were "The Blessing", "Baked in the Fire of Love", "The Freedom Bird" and "The Tea House". MUSEartspace is a great space and my thanks goes out to owner Renee Laprise for her support.